Our membership numbers stayed relatively stable this year. We did have three new graduates join us under the new program that we funded where the branch waives local dues and pays the $11 state dues, so new graduates (any degree) may join under the national Give-A-Grad-A-Gift program and pay $0 for the first year. Please think about your friends who might fit this program. They were among the total of 11 new members. 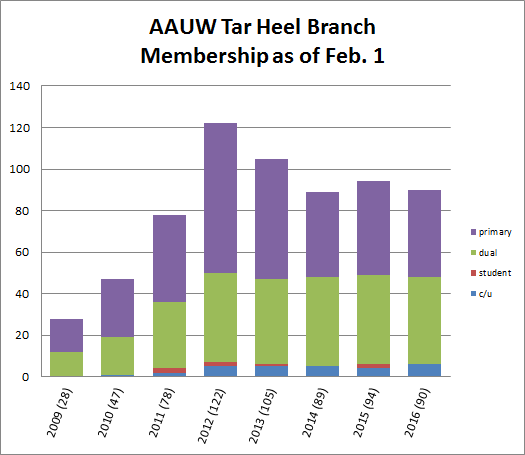 We didn’t recruit any Shape the Future new members, but three members took advantage of our discounted dues (we recommend $40 — instead of the normal $65 — and will accept $20) for those who value their AAUW membership but cannot afford full dues. On the other hand, we did have 14 members resign or lapse and we still miss Leslie Syron who died. That means our total membership changed from 94 to 90 over the year. Since February 1, three new members have joined us and our count is now 93. To renew your membership, check for your member ID and go to the AAUW NC membership page for quick access to a personalized online renewal form. To renew, use this www.aauw.org link or check our Join page for additional options.